We sell more icons in more formats than anyone else- and we ship faster too! Most styles ship within two business days. 10. We strive for excellent Customer Service! Started online in 2001, OrthodoxGifts.com is privately-owned and operated by an Eastern Orthodox family (and a few others who we consider to be family). We strive to operate with traditional Orthodox Christian principles and a strong work ethic. We will personally reply to any questions or concerns within 24 hours or less. Why should I shop at OrthodoxGifts.com? We specialize in customizing merchandise and preparing your gifts for delivery to any address you choose. Whether you're buying supplies or a gift for someone special (or yourself), we are here to make sure you get the quality and service you deserve, and at a reasonable price. To that end we offer free gift wrapping on most products and premium gift wrapping for a small fee. We apply personal attention to make sure each order goes out packed safely, accurately and quickly. We're internet shoppers, too, and know that you don't want to wait a long time to receive your order. We try to ship all orders within 2 days, but usually can ship same-day if you order before 1 pm EST. Some items require more lead time, as noted in their product descriptions. But if you're in a rush just ask us if it can be expedited and we'll do our best! Are your icons and crosses blessed before you ship? We are proud to support numerous Orthodox monasteries and church organizations by reselling their products. Although we have an Orthodox priest on staff, he does not bless any items before they ship and encourages you to take such items to your parish priest to be blessed. Can you print my custom design on your invitations/clothing/art products? Yes! We utilize state-of-the-art machinery to print professional high-quality products. We can custom design your product or create it with your design. Contact us for a quote. Do your offer church discounts? We offer reseller discounts to wholesale accounts. Your church can apply for one here. As is a pious Serbian Orthodox custom, we celebrate St. Nicholas the Wonderworker (Dec. 6/19) as our Slava, or Patron Saint. Each December we hold a big Slava celebration and offer many discounts and giveaways to celebrate. We are so grateful to St. Nicholas for all of the help and guidance he extends to our staff and customers and truly appreciate all of his intercessions before our Lord. 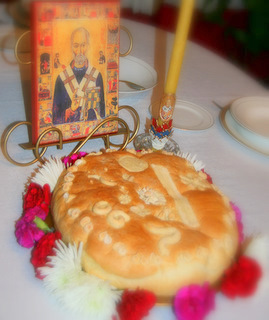 The photo above is of our Slava Kolač from last year's celebration.